The Recruitment module allows you to track and manage employee information throughout all phases of the hiring process. Our multi-user approach allows single or multiple HR managers to create, edit and post jobs, rate potential candidates, and to review resumes and documents that are submitted by each applicant. Link the job to your company's "Employment Opportunities" web page then watch your email Inbox as you are notified of new job applications. Each candidate's data is secure and available 24/7 to each member of your HR team. It's the easiest way to track and manage applicant data efficiently and securely over the Internet. 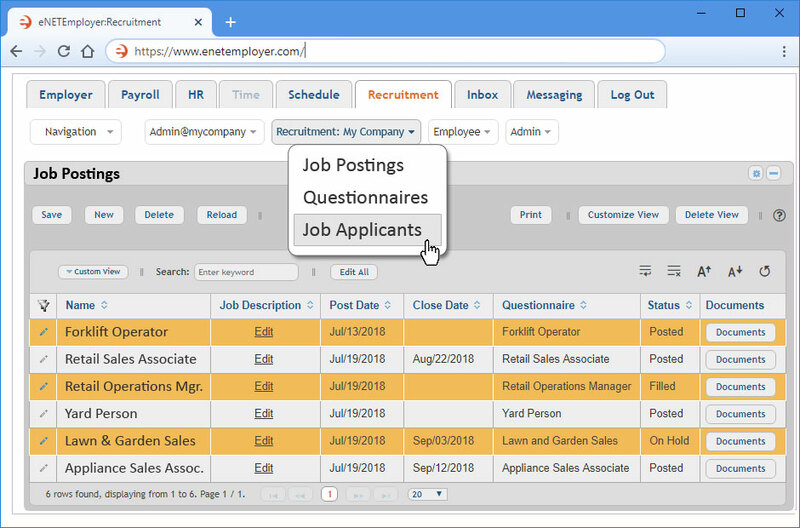 All job postings can be assigned a series of customized questions that will allow the system to automatically sort the top candidates. The built-in weighting system evaluates the importance of each response when calculating the applicant's overall score. If a certain question is more important, then you simply assign a higher weighting value. Use the Document Storage feature to manage each applicant's information in a convenient location. This can include their resume, cover letters and any other documents they submit. Assign a five-star rating to top candidates and include comments that can be reviewed by each member of your hiring team. Efficient submission tracking makes multi-department hirings easy and helps you to better manage large numbers of applicant submissions. Post All Job Types - Use the advanced editor to create eye-catching posts that include text-based job descriptions along with rich media, PDF and other documents. Email Followup Messages - Automatically send email messages to applicants after they have submitted their job application. FTE - Full Time Equivalency - Include information on each job's Full Time Equivalency. Jobs can be sorted by this value or you can use it to measure a worker's involvement in a project, or to track cost reductions in your organization. Automatic Post and Close Dates - Set a future date for a job posting so that it goes live on the Internet without having to post it manually. 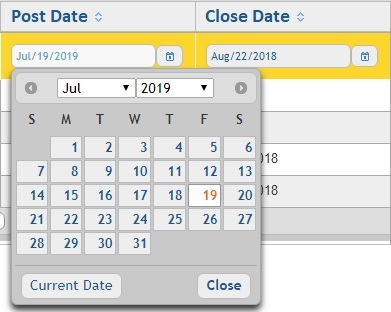 Automatic closing dates will ensure that the job is removed based on your specific schedule. Custom Job Questionnaires - Create a set of custom questions that will be required from each job applicant as they apply for a given job posting. You can create an unlimited number of entries in each questionnaire. Weighted Applicant Scoring - Assign custom scoring values to each question to ensure that the top candidates rise to the top of the list. Important questions can receive higher values based on your specific preferences. Manage Each Job's Status - Assign a status setting for each job to easily keep track of its standing. Settings include Created, Posted, Filled, Cancelled and On Hold. Store and Review Applicant Documentation - Review documents that each applicant has submitted (resumes, cover letters, images, etc.) and include your own documents as part of the review and hiring process. Manage Each Applicant's Status - Assign a status setting for each applicant to keep track of their status throughout the hiring process. Settings include Application Received, Under Review, Phone Screen, Interview, References, Offer Tendered, Hired, Not Suitable and Do Not Hire. Application Updating - Applicants can revise their job applications and even add new documents of remove submitted ones as needed. Choose the Get Started button or call 1-800-665-5129 to get started with eNETEmployer Recruitment!